Parents and educators always ask Rustic Pathways staff what it’s like straddling cultures and homes. My husband Harry and I have a 2-year-old son and split time between New Orleans and Santo Domingo in the Dominican Republic. We normalize our lifestyle because it’s what we (and many other Rustic staff) do every day, but stepping back, it does look a little crazy sometimes. So I’d like to describe how we spend the holidays and the months after. Raising our son between homes and as we travel is an adventure, and we’re excited he’s learning along the way about different cultures and traditions. I want to start by rewinding a year and telling you about these past 12 months. Last December, we we celebrated the holidays in Costa Rica with our beautiful Tico team (hey guys!) and then our jobs and lives took us, in different combinations of us, on this route: New Orleans (winter and spring home), Chicago, Hawaii, the Dominican Republic (summer and fall home), Cuba, Tanzania, Boston, Mongolia, Thailand, Laos, Cambodia, and now this week to the Bronx for the holidays. My family has Irish and Italian heritage, hailing from the Boston’s North Shore. Harry’s family is Dominican and is split between the Dominican Republic and New York. 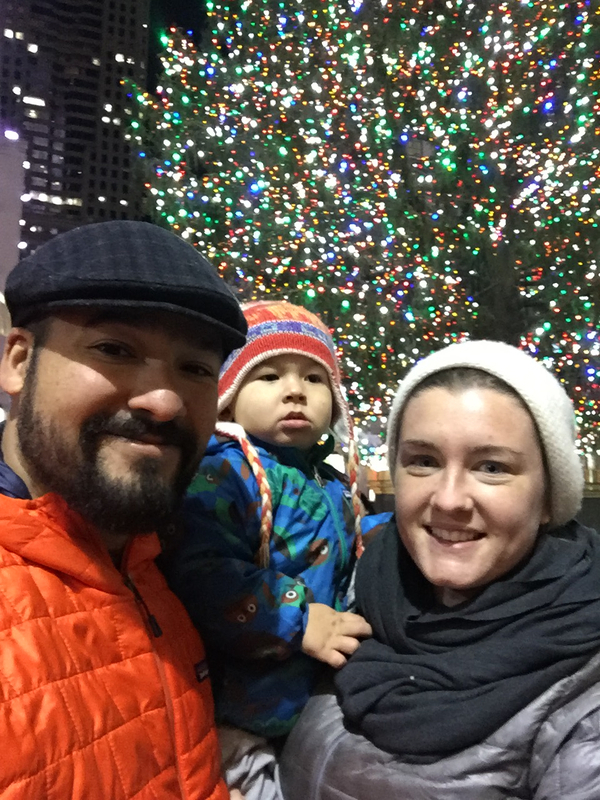 Because we spend so much time outside the United States during the rest of the year, our family observes several traditions during the holidays. We usually celebrate a few days of Hanukkah with friends in New Orleans, frying latkes and having late nights with the kids. Our community represents a number of religions, cultures, and places of origin, so we love celebrating with people as they share their families’ traditions and quirks with us. Christmas Eve is a big deal! We spend it with family and, depending on which side, it either consists of dancing bachata and opening presents at the stroke of midnight, or around a quiet fireplace with kids asleep by 8. Both are lovely! Same-same but different! Lots of food. Whether it’s Irish, Italian, Dominican, Cajun, Chinese….there’s just so much of it! We eat 12 grapes at midnight at each stroke of the clock! It’s a tradition in many Spanish-speaking countries. Just make sure you get seedless grapes, and preferably small ones! This is usually after a massive New Years Eve / Nochevieja feast with friends and neighbors. Jan. 6 marks the beginning of Carnival Season in Louisiana, which includes regular parades and consuming king cakes, and continues through Mardis Gras on Feb. 13. It’s also El Dia de los Reyes in many Spanish-speaking places, a gift-giving occasion celebrating the day the three kings arrived to Bethlehem. After the spring festivals in New Orleans, we head back to the Dominican Republic for another Rustic summer. Really, it’s just the beginning of another whirlwind year of traveling wherever adventure takes our family. Our son loves trying new foods, making new friends, and exploring wherever he goes. He’s met thousands of students, Rustic staff, community members, and plane seat companions. We wouldn’t have it any other way. Lauren brings experience from across Rustic Pathways’ sales and operations, including as our Strategic Partnerships Manager and USA Country Director. She lives between two Caribbean cities—New Orleans and Santo Domingo—and spends time by the ocean in New England where she grew up. She is a Temple University alumnus and non-fiction reader. You can usually find her hosting unexpected parties, exploring cities, or hiking the bayous with her family.